In December 2014, average pay of these professionals, according to indeed.com, was $22,000. These figures are 11% lower as compared to the national average. According to a survey conducted by the BLS (Bureau of Labor Statistics), the yearly and hourly average wages of CNAs, in May 2013, were $20,660 and $9.93 respectively. The total number of certified nursing assistants working in the state, in the same year, was 23,140 and the employment per thousand for this job was 1.14. Although the annual salary of a CNA in LA is less in comparison to other states, but due to the increasing demand of nursing assistants, more people are approaching this profession. Once you complete the CNA Program program and pass the relevant certification exam, you can easily opt for CNA career. 90% of CNAs made less than $27,690; 10% made more than $27,690. 75% of certified nurse assistants earned less than $23,240; the remaining 25% earned more than $23,240. 50% of the employees earned less than $19,910; the rest 50% earned more than $19,910. 25% of employees were offered annual wages less than $17,580; 75% were paid more than $17,580. 10% of CNAs were paid less than $16,250; 90% were offered more than $16,250. The salary of a nursing assistant is majorly influenced by the cost of living of a particular place. 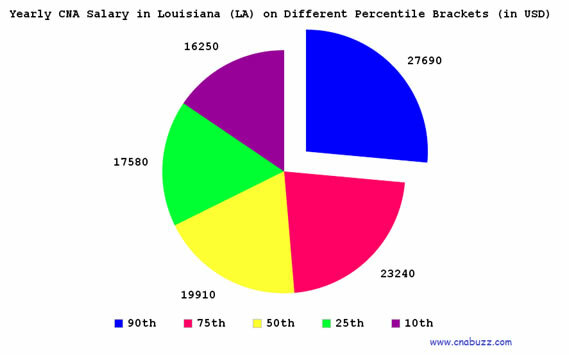 The data given below indicates that the cities where the highest median salary ($26,860 per annum) was provided were Kenner, Marrero, Metairie and New Orleans. The median monthly salary varied from $1,815 to $2,238. The minimum median weekly salary was $419, and the maximum was $517. The median hourly earnings fluctuated from $10 to $14. Alexandria was the lowest paying city. Each job title has its particular requirements to be fulfilled. The candidates holding a higher position stand a chance to earn more than the others. Different professional holding similar titles in the nursing field were paid between $13,000 and $28,000. The highest paid workers amongst these were CNA Hospice ($28,000); Medical Assistant Family Practice and CNA Rrmc ($26,000); CNA Float Pool Riverbend, CNA Medical Surgical and CNA Neurology Riverbend ($24,000). Correctional Prison Facility CNA earned the lowest income. According to BLS (Bureau of Labor Statistics), the job opportunities of CNAs are projected to grow by 21% in the upcoming years as compared to the average of all other occupations. The only hindrance that might reduce the demand of nursing assistants is the fact that a number of nursing homes are dependent on government funding. Question 1 – At present, I’m living in the state of Connecticut, but I’m shifting to Louisiana in a couple of months. Can anyone tell me the average CNA salary in LA? Answer – According to indeed.com, the average salary of these professionals in the state of LA was $22,000 as of December 2014. 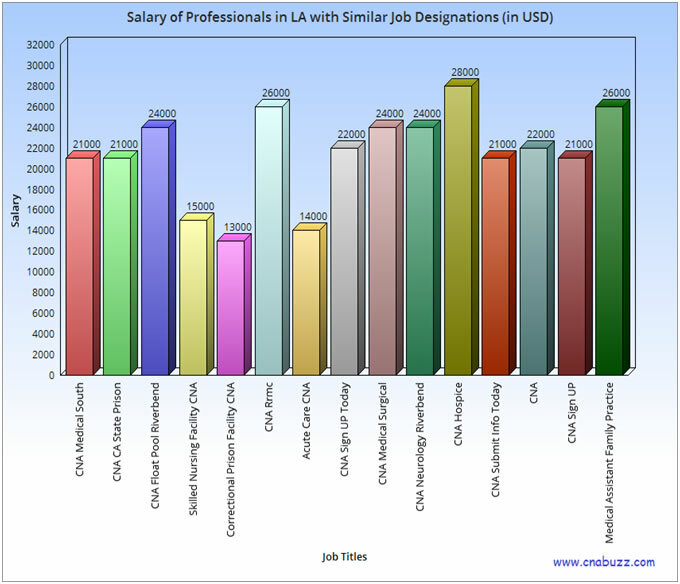 Question 2 – Can anyone suggest me some top paying job titles in the state of LA? Answer – Among various job titles, CNA Hospice earns the maximum annual salary ($28,000). Other job titles are Medical Assistant Family Practice, CNA Rrmc, and CNA Float Pool Riverbend.